Think about every Christmas story you've ever heard - all told by three actors and a "reingoat" in 90 madcap minutes of nonstop hilarity. From Ebenezer Scrooge to a certain adorable claymation reindeer, no sacred cow is safe from skewering in this hysterical roller coaster yuletide treat. You'll laugh till your belly shakes like a bowl full of jelly! Thus writes Freddie Ashley (Artistic Director of Actors Express) in his program notes for �Every Christmas Story Ever Told,� what he hopes will be AE�s traditional entry into the holiday season stewpot. I couldn�t agree more. My only problem is that this play, this production, offers no opportunities for laughter at all, and, for me, was a crushingly dull exercise in lame ideas and joyless excess. Rather than cast critical brickbats at the cast, director, and designers here (who shall all remain nameless because they�ve done good work in the past and will again, and don�t deserve the sort of dilettante scuds I have been known to toss), let me try to articulate why this play fails to the extent I believe it does. First, it starts out with a conceit that will raise the skeptical hackles of anyone who works in the theatre. A fairly straightforward production of �A Christmas Carol� is stopped in its tracks when a cast member decides, on his own, that he�s sick to death of Dickens, and would rather do another Christmas story. At the start, we�re given to believe that stage management and fellow actors would actually let this slide and go along with him. What�s worse, the actor has no stories in mind, and the cast polls the audience for Christmas story ideas, all of which they blithely ignore. Next, there is no sense of parody to any of the stories � they�re just retold, edited down to bare bones. It�s as if we�re given a Reader�s Digest version of the stories, with no sense of affection and no effort at wit. Even the stories themselves do not even approach the �Every Story� standard expected � we get only four or five (at the most), with a lot of extraneous (and non-funny) junk thrown in � a trivia game about fruitcake, a look at Macy�s Thanksgiving parade that is simple painful to sit through, a finale that combines the titles of dozens of Christmas Songs into one blandly scored, badly rhymed mash-up. The entire second act is made up of a mash-up of �Christmas Carol� and �It�s a Wonderful Life� that simply fails on every count � stories that blend well, jokes that fall flat, bad Jimmy Stewart impressions, man-in-drag nonsense, and a Potter who is pointlessly blocked to drive his out-of-period wheelchair in circles for an entire scene. It�s a perfect storm of bad writing, bad acting, and bad direction that is just too dull and unfunny for words. The production even avoids the effort of making the cast go through fast changes and quick character swaps by using a troupe of interns to �fill in� roles while the stars make their own changes. I�m sure some of this is scripted (a particular egregious example is a comely blonde intern being yanked off stage and replaced by a large man in drag just in time for a kiss), and, if so, it�s another example of a desperate grab for a cheap laugh. Irritating also is the need to pull folks from the audience for several bits, most of which end up humiliating the audience member selected. (Although kudos to a recent Actors Express actress who was called upon to play the Fruitcake game and managed to inject a little bit of humor and energy into the proceedings). I hated those moments and cringed every time a cast member walked into the audience. A mostly bare stage backed by an attractive Victorian-esque building serves very little purpose for the production (or its �Christmas Carol� conceit). Upside-down buckets on castors are used throughout in various guises and for various purposes, but, again, in various contrivances (how many theatres do you know keep a supply of buckets on castors handy?). I suppose most of my comments could be written off as non-indicative of how the general public will react to this show, but, if Tuesday�s audience is any guide, I may be in the majority this time. I cannot recall a single laugh coming from the audience all night, and a large portion of them did not return after intermission. 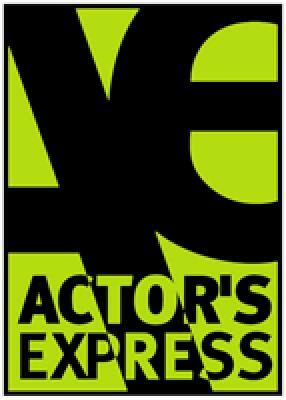 Still and all, I am a big fan of Actors Express, and wish I could be more positive in my comments.